Daub Alderney Ltd was created back in 2008. The company were the original owners of the hugely popular Wink Bingo and also Posh Bingo site too, but they then sold both sites over to 888 Holdings in 2009. The company then went quiet for the next few years to follow, but the newer more advanced Daub software soon returned with a bang in 2012 as part of the Stride Gaming Group. The Daub network now power 8 bingo and casino sites in total, including Kitty Bingo and Lucky Pants Bingo plus the Magical Vegas and Spin and Win casino sites too. Since Daub Alderney Ltd first began over 10 years ago now, the company have always offered a very personal service with a nice intimate feel. They pride themselves on brilliance in customer satisfaction and have a strong focus on the passion, respect, collaboration and innovation behind all of their products and services offered. They may not power many platforms all in all, but the ones that they do are of excellent quality. The Stride Gaming Group are a leading online gaming operator providing unique software to over 100 online bingo, casino and slots gaming brands across the globe. They are one of the largest online gaming operators in the UK today and since merging with companies such as Daub Alderney Ltd in 2012, they now have over 25% share in the UK online bingo market. Minimum deposit £10. Maximum Bingo Bonus £150, Maximum Slot Bonus £50, 100 Spins @20/day, valid 24 hours on Exclusive slots. Maximum withdrawal £250. Wagering terms apply. Max bonus available is £150, min deposit is £10. Must opt in. 300% bonus available to use on games only. Free spins credited as 5 x 20 spins per consecutive day from date of first deposit, & expire after 24 hours. Daily log-in required. Bonus and free spins carry 4 x wagering requirements. The Daub Bingo network and the Stride Gaming Company also power Give Back Bingo and also Bingo Extra too. You will also find several casino and slots titles within the Daub/Stride Gaming brand as well including Lucky VIP Casino, Regal Wins, Magical Vegas and Aspers Casino. The Daub online gaming software brand was originated and developed by a team of gaming veterans in 2008 in Alderney of the Channel Islands. The company still continues to be licensed and regulated here over 10 years later, and the brand still remains at the forefront of the online bingo industry. Passionate – Fierce and excited about the products they deliver. Respectful – Thoughtful to those involved with the company. Innovative – Dynamic and inventive in all software and brand designs. Collaborative – Dedicated to succeed as a team. Accountable – Responsible and have ownership of all the work they do. The company originally set up the hugely popular Wink Bingo and Posh Bingo branded sites, which they then continued to operated for the first year of business and built them both up to great success. In 2009 Daub sold these sites over to 888 Holdings Ltd however, and the company then disappeared off the radar for the next 3 years. In 2012 the Daub network joined forces with the Stride Gaming Company, and the software then made a comeback with some excellent online bingo, casino and slots sites. The most popular are Kitty Bingo and Lucky Pants Bingo, which both attract huge followings due to their completely unique and bold theming. The brand work hard to really stand out from the crowd, and each site is innovative, fresh, fun and exciting in design. All of the sites offered on this software have the most up to date features and specs, and as the company only power 8 brands in total each individual site is kept to best standard at all times. The Daub network is now completely compatible with all mobile devices, tablets and laptops too, making all of their sites even easier to use and more accessible at any time. 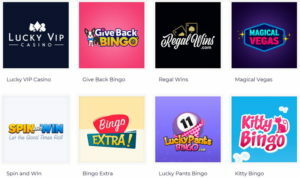 The free mobile bingo site apps can be downloaded via both Android and iOS operating systems, and the same account can be used across several devices. The mobile platform also sometimes incorporates exclusive offers throughout the day too, and has easy connections with lots of fun social media platforms. Nearly all of the sites powered by the Daub software are very bright and colourful, and they all offer players a real sense of fun and cheekiness as well as some fantastic gaming. The company also have customer satisfaction at the forefront of their minds, and the team are consistently working hard to offer the best customer service possible. The Daub bingo software is of excellent quality, however the choice of gaming is kept fairly basic. You will find several fun themed rooms that are tailored to each individual site, and the gaming is all classic and simple in style. Some of the rooms will span across the whole network from time to time, and therefore certain games and jackpots will be spread across all of the Daub bingo sites. As there are only a few Daub online bingo sites however, rooms won’t get too crowded and there shouldn’t be too many players still giving the sites a nice intimate feel. Although the styles and variants are quite limited on this brand, the Daub network offers some brilliant classic style online bingo games that each have a real authentic bingo feel. The Daub bingo sites are generally all really good value for money too. There is always free bingo on offer throughout the week and ticket prices are really cheap with prices starting at just 1p. The Daub network also offers players a great chance to get involved in the social side of bingo and gaming too. There is a huge focus on the community hubs and chat games throughout, and nearly all of the Daub sites will have personal blog pages, winners tables, competitions and also lots of connection with social media sites like Facebook, Twitter and YouTube. You won’t find any bingo games at these online casino sites, however all of the Daub bingo sites do all offer a great variety of slots, casino, table and arcade games of their own. The specialist Daub software has several titles that are completely unique to the brand that won’t be found anywhere else, and they have each been specifically developed in house at Daub and offer a nice personal feel to the brand. Although the Daub network doesn’t have a huge range of online bingo sites, the jackpots and prizes are still pretty great. As the ticket prices are so low it works out really good value and all of the sites also offer progressive and community jackpots too. At Kitty Bingo there is a special prize fund called Kitty Cash. This is where a small percentage of all tickets bought on certain 90-ball games contributes to a big progressive jackpot that can be won by calling a full house in less than 31 numbers. There are also progressive jackpots available on lots of slots titles too. These tend to be much bigger as they are linked up with lots of other games brands that are shared throughout the online bingo world. As with all online bingo software, each individual company has to be licensed and regulated by a governing body and gambling commissioner to ensure the safety, security and fair play of all its players. The Daub Alderney Ltd software company are licensed, registered and regulated by both the UK and Alderney Gambling Commissioners, and each site pride itself on first class customer safety and satisfaction. There are rules stated on each individual Daub online bingo site which must be abided by, and should you ever come across anything suspicious there are plenty of ways to contact the customer service teams if you ever feel unsafe. The Daub brand has been tried and tested now for nearly 10 years however, which should give you peace of mind knowing that you would be gaming with a trusted and responsible company. As there are only a few sites running on the Daub Alderney Ltd software brand, each one is given absolute full care and attention at all times. They are slick and sleek in design and navigation, and they are each bursting with tons of colour and personality. The branding is really strong on all of the Daub sites and the theming is generally quite cheeky and fun across the board. With names like Kitty Bingo and Lucky Pants Bingo, you can sort of tell already that the sites are going to offer the fun factor throughout. This doesn’t make them less classy however and although the theming is always very bright and bold, it never feels too cheesy and the platforms are all still of a really great quality. I’d say that the Daub network attracts players who enjoy the whole package of a platform rather than just the gaming it has to offer. Whether it be the cute kitten theming at Kitty Bingo or the pure cheekiness of Lucky Pants Bingo, players will get a full experience when playing at any one of these sites. The community hubs and social media pages will all also be themed around the site too, and you will be playing with and meeting other people who share a passion for a similar gaming style. Should any problems arise whilst using a Daub Alderney Ltd online bingo site, you can always use the FAQ section on the site itself to search for any troubleshooting tips. Each site will also have their own dedicated customer service and help team on hand 24/7 too. 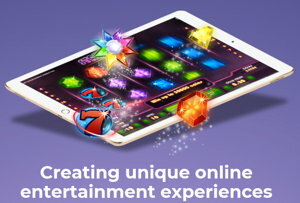 Even though the Daub software brand had a slight hiatus for a few years along the way, they have still managed to maintain an excellent reputation within the online bingo and gaming world. As the original creators of both Wink and Posh Bingo as well as going on to create Kitty and Lucky Pants Bingo too, this brand certainly know how to produce excellent bingo sites with real character. All of their sites have gone on to create a huge buzz in the business, and although Daub don’t run a huge amount of sites they certainly focus on the quality and excellence of the ones they do. Each Daub Alderney site continues to run and grow by the day to much success, and the brand is still very well known and highly regarded across the online bingo community. The Daub Alderney Ltd software has been established for nearly 10 years now. All of the sites that originated on the Daub network are still running today to much success. 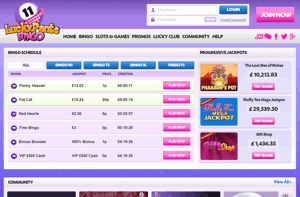 They only power a few online bingo and casino brands, so each site is maintained to an excellent standard. The branding and theming of each site is bold, bright and fun throughout, however the sites never feel too cheesy or tacky. Each Daub Alderney site has its own unique style, however games rooms are linked across the network meaning bigger jackpots and more chance to win. There is a huge focus on community and the social side of gaming at all Daub Alderney sites. You will find lots of blog pages and links to social media hubs, plus additional fun chat games and physical prizes up for grabs. The software is compatible with all mobile devices, so you can game on the go with the most up to date mobile gaming apps. If you’re looking for an online bingo site that doesn’t take itself too seriously yet still has great quality gaming, then why not give a Daub Alderney site a try. You will find some really cute, fun themed sites, that offer a great social feel with some excellent bingo games to boot.